I'd like to thank everyone who came out for this Raptor Run, went to lunch at Novaks, and persisted through the afternoon with the birding until after 3pm! Your enthusiasm made this a wonderful success. Sunny with light fog/mist in regions further west closer to the Willamette River. We had seven cars, (although one of those met us at Halsey), and a total of 23 people. 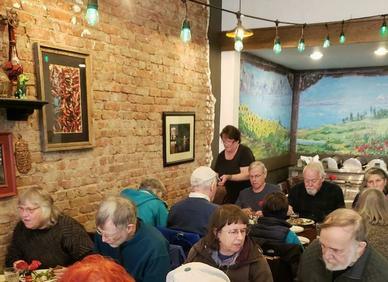 Most were planning to attend the lunch at Novak's Hungarian Restaurant. It had been foggy in Eugene but was clearing off by 9am. 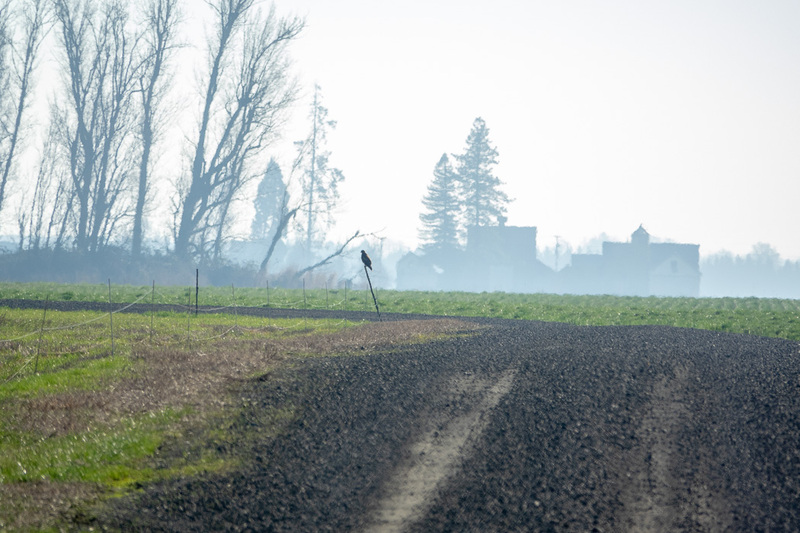 But as we drove north on I-5, we found fog which became thicker and thicker not only to Halsey Public Park, but beyond that all the way to the Eagle Roost. 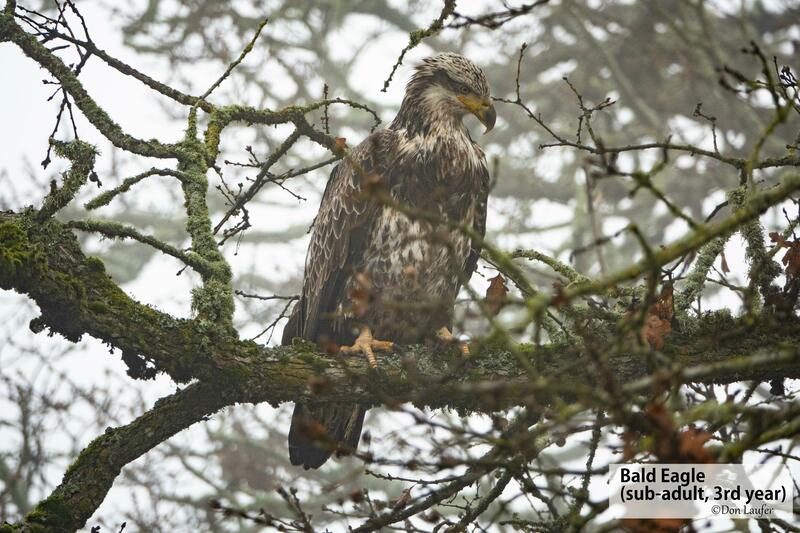 We arrived at the Eagle Roost around 10:30, having seen a few Bald Eagles, Kestrels and Harriers which were close enough to the roads to be seen through the fog. But at the Eagle Roost, we could not even see the Roosting trees along the Calapooia River an eigth mile to the east. It was at this depressing moment (11am) that a few cars (about 6 people) decided to turn back early because of the fog. All but one or two of them needed to be back in Eugene before 1pm anyway. 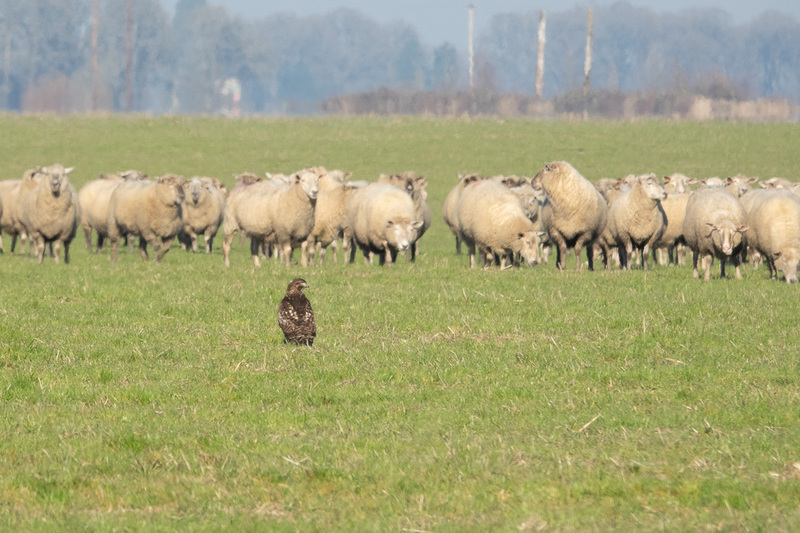 I hasten to add that Doris had already managed to get 15 species on her bird list, though only a small handful of those were Raptors. This left us with four cars with 17 people, all of whom stalwart Raptor-watchers through the afternoon hours, driving miles and miles through the grass fields of Linn County. The Eagles Brighten the moment! 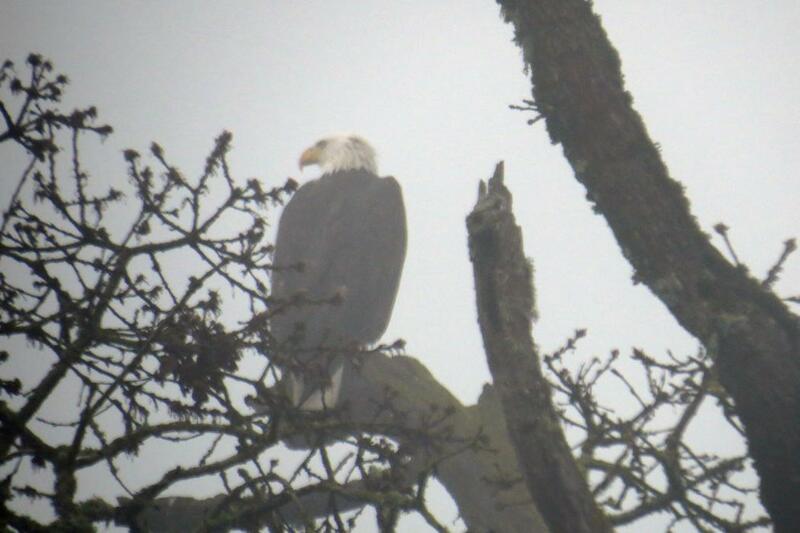 As we began to go north to head for Albany, we got no further than 1/4 mile, when, in spite of pretty dense fog, we were treated to some Bald Eagles, both close to us and a group in a tree to the west. 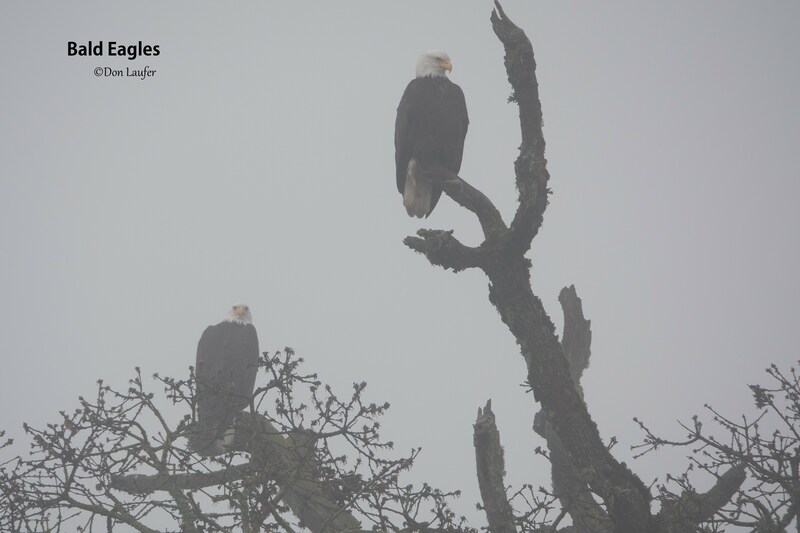 As close as these two Eagles were, you can see how foggy it was by how much fog is between us and the Eagles. Everyone got out of their cars to enjoy the Eagles. (The second photo was taken by Dave Stone). After 10 minutes with the Eagles, we drove into Albany, somehow not losing any cars along the way. 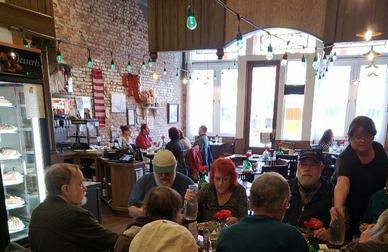 These first two photos inside Novaks give you a glimpse of the historic old brick building and the dining room. Views looking out toward the front window and looking towards the back wall, capture at least a portion of most of our group of 17. Greg Hyde, and to his right, (viewer's left) Greg and Sharon, a couple whose names I have finally learned. 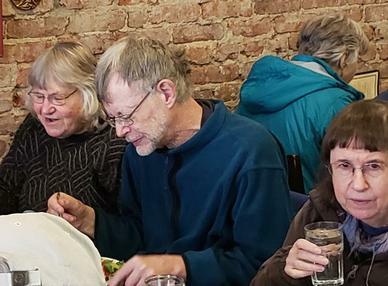 Betsy, Bill and Pat, Mary Lee, facing them with backs to the camera. 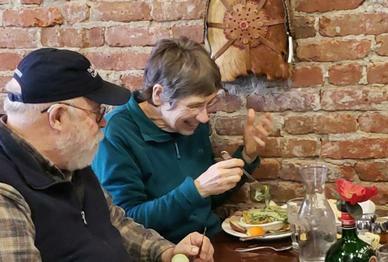 BELOW: The source of BOGS inspiration, Floyd Weitzel in white top and green hat, sitting next to Mary Lee. Donna and Ken sitting across from them. The other gentleman is unfamiliar to me, but he and his wife were with us for the Raptor Run. Nancy was clearly enjoying herself. Greg is sitting next to her. My thanks to Nancy for being my driver on this long day on the backroads. I know it can be tiring to drive these trips, and she did a great job. As we stepped out of the restaurant the Sun was shining and we could see blue sky above us. I gave instructions for getting back to the Eagle Roost since that was not the original plan and not written up. It was just the reverse of how we got from the Eagle Roost to the restaurant, but folks had only driven that once. In any case, no one got lost on the way. When we arrived back where the Eagles had been, about 1/8 mile north of McLagan & Seward, we saw a couple Eagles in a tree right at the edge of the road. One was adult and quickly flew to another tree. Some of our group got spotting scopes on it and Don snapped this nice photo. You can see that fog is no longer an issue. 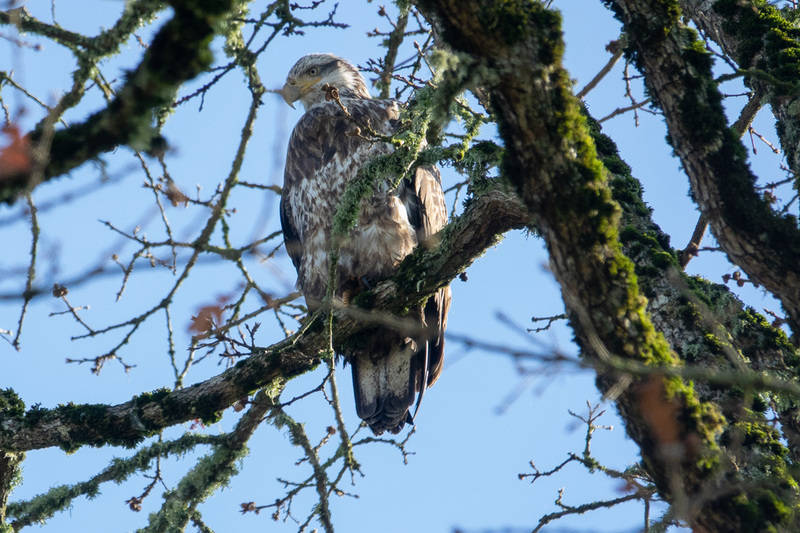 There was a tree on the west side of McLagan Rd which by Janet's careful count, had as many as 9 Eagles perched in it some of the time in various places. 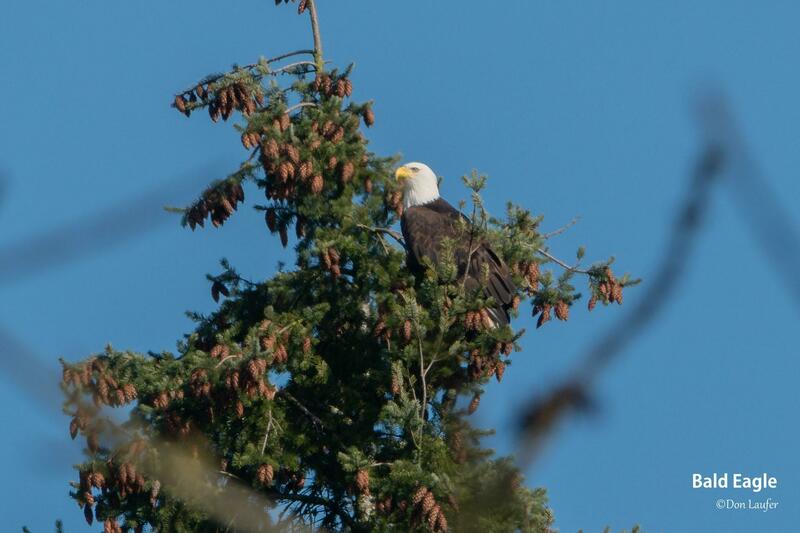 This left us wondering if perhaps some of the Eagles were starting a new Roosting location. 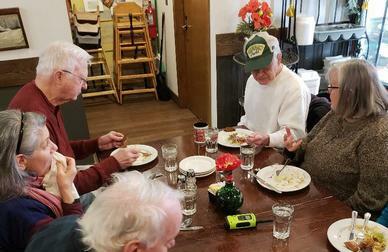 "It was after lunch; we were driving south along that part of the road. 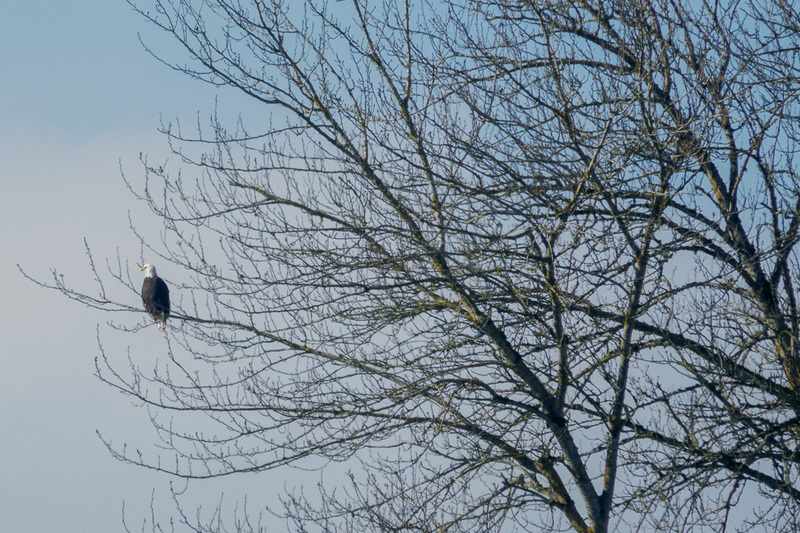 We saw 2 bald eagles in a tree or trees along the road going south, and approx. 1/8 or 1/3 mile later saw the 2 eagles in a tree right at the road. 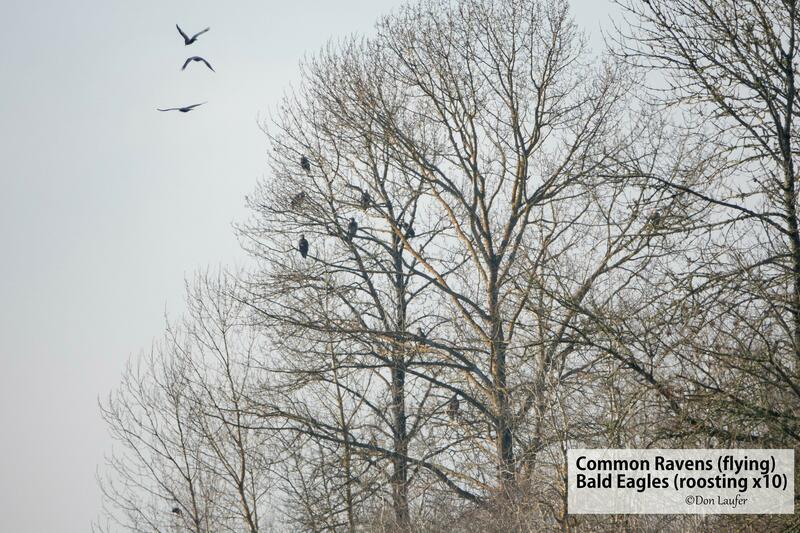 I also counted 9, not 8, bald eagles in the tree at the west end of the row of trees west of the road. One flew off ... and a few minutes later when I looked there were 9 again, plus there were now also 2 in a tree in that same row W of the road, about 3 or 4 trees closer to us than the tree with 9. I actually wrote down the time! We were parked there from about 1:02pm. - 1:12pm." 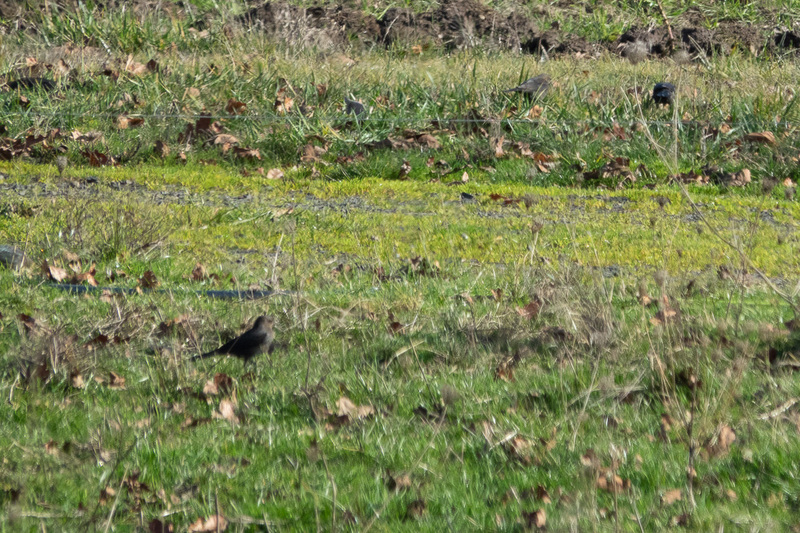 There were some Brown-headed Cowbirds near the road. Everyone was looking around at Eagles and Cowbirds and any other birds to be seen. Spotting scopes were out, as well as cameras. There was one very interesting Bald Eagle in the tree straight up over our heads. Don had mentioned this bird to me during lunch, saying it had an almost white head but had a light brown eyestripe somewhat like an Osprey, and some white on the breast like a Red-tailed Hawk. The bird was still there on our return after lunch, so I photographed it. I wasn't the only one going after a photograph of this bird. But it was the breast feathers which I found to be the most unusual thing about this bird. 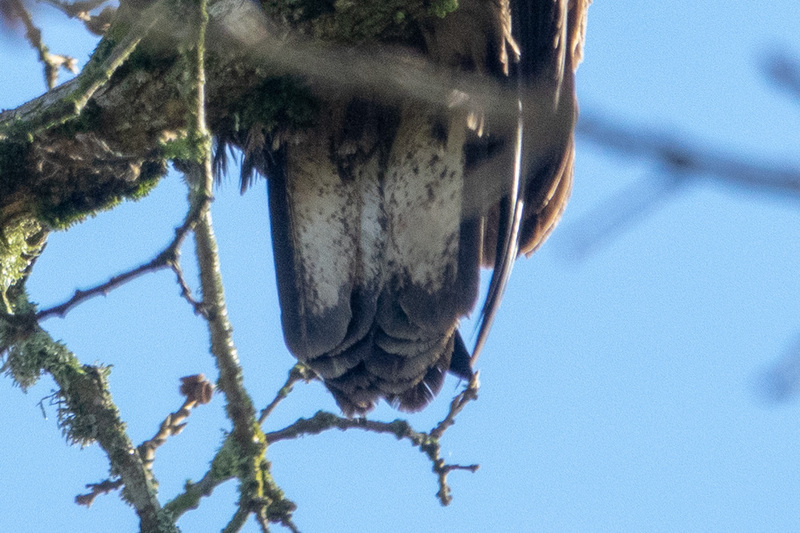 There appear to be three horizontal bands across the breast, each with feathers of a different length and coloration. In the days after the Raptor Run, several of us dove into the field guides and discussed this bird. The consensus for the most part is that it is a 3rd calendar year bird in what is called "2nd basic plumage". Sibley's latest edition shows an illustration matching our bird, including the eye-stripe; except for the extreme difference in the length of the feathers in the three bands on the breast. None of the guides seem to discuss that aspect, but Sibley and others do show the "bands" of differing coloration. 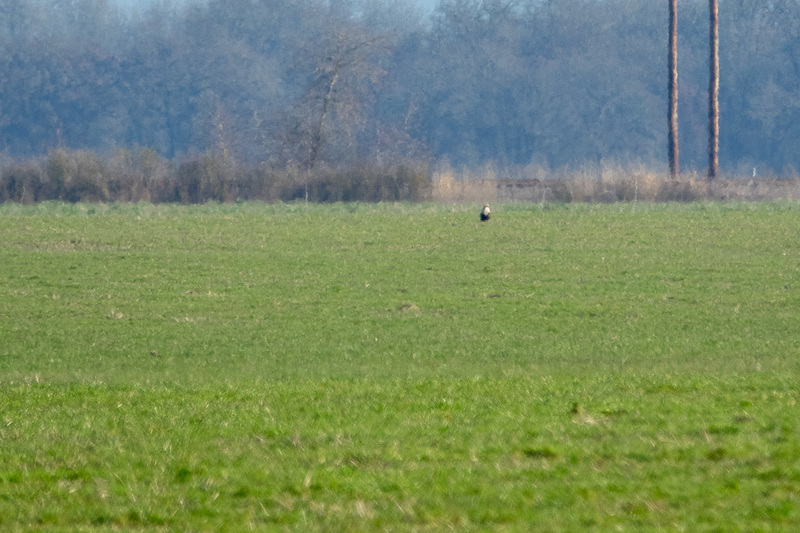 Since we were so close to this Eagle, I cropped down to show only the tail in the next photo, to show that it was not yet entirely white, which means the bird is not yet five years of age. 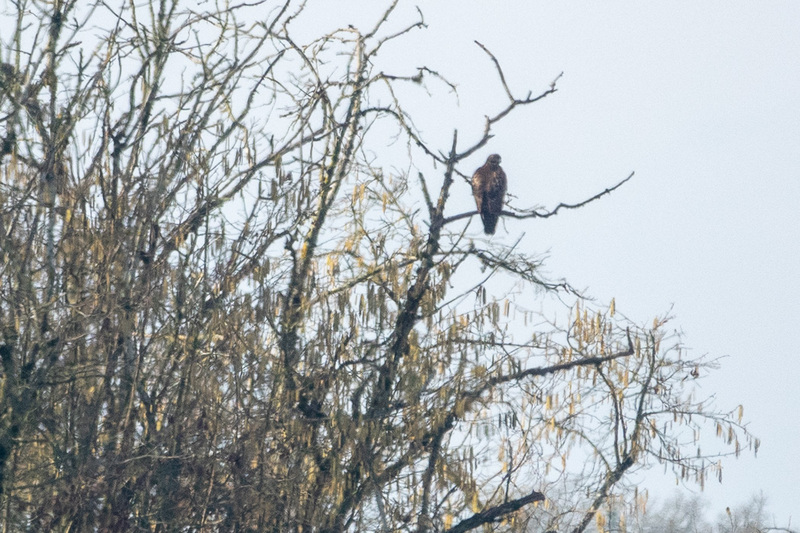 The photo also shows the tail feathers to be somewhat weather-worn. 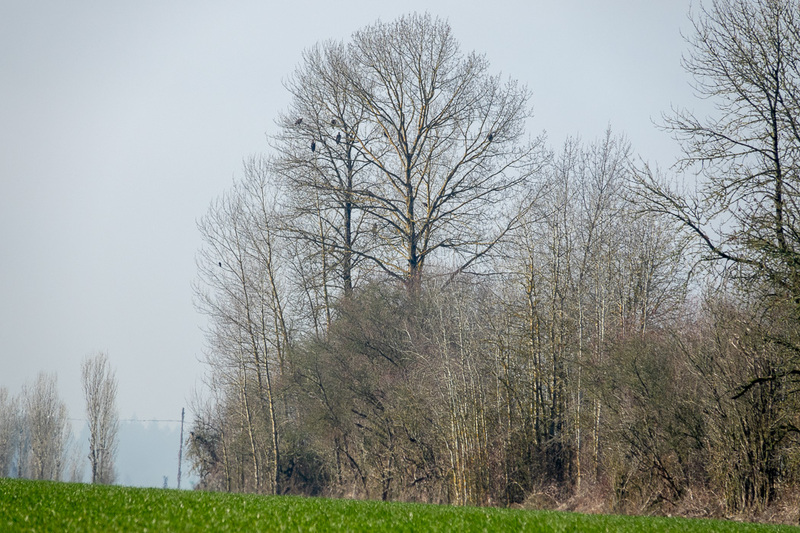 "Plus as we went south from there, there were 5 eagles in the main Eagle Roost trees to the east (left) of the road." 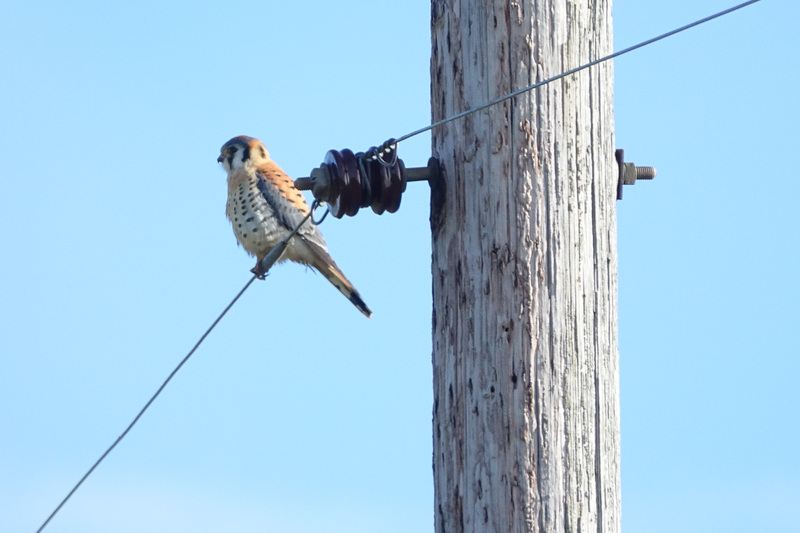 This next American Kestrel photo was taken two minutes after the last one, maybe 1/8 mile further down the road. This one began dive-bombing a Red-tailed Hawk as we were driving by, very near to Davis Rd. 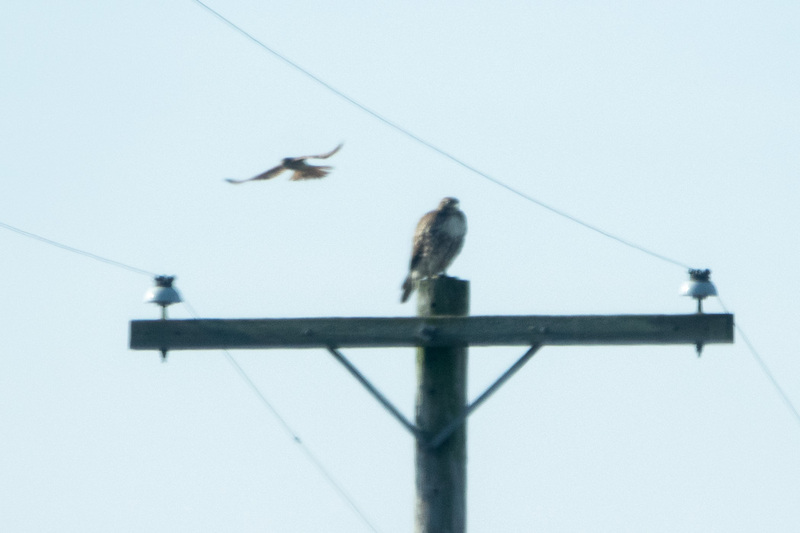 The Red-tailed Hawk is shown in the photo after the Kestrel, and the "dive-bombing" is shown in a four-image collage further down. We stopped as soon as we completed the turn south onto Davis Rd. 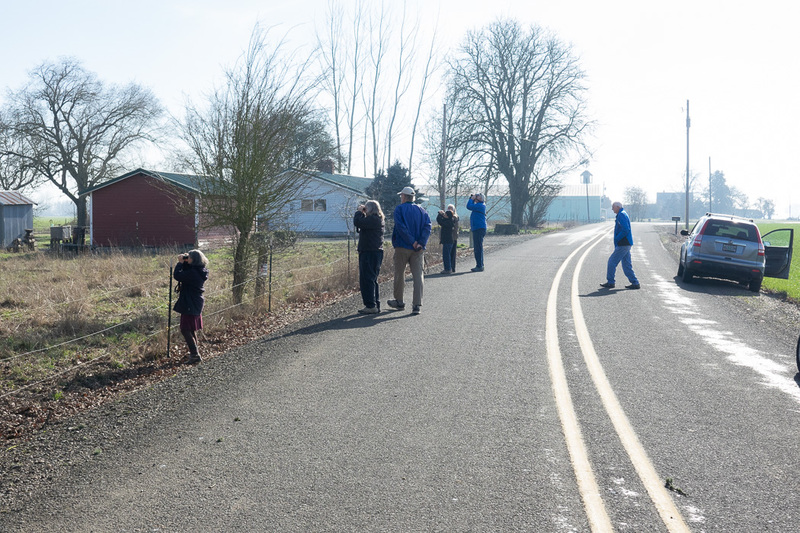 We checked the culverts for the impossible-to-find Burrowing Owls, and I am no longer surprised that in all the visits to these areas, I've only found one West of the Cascades. 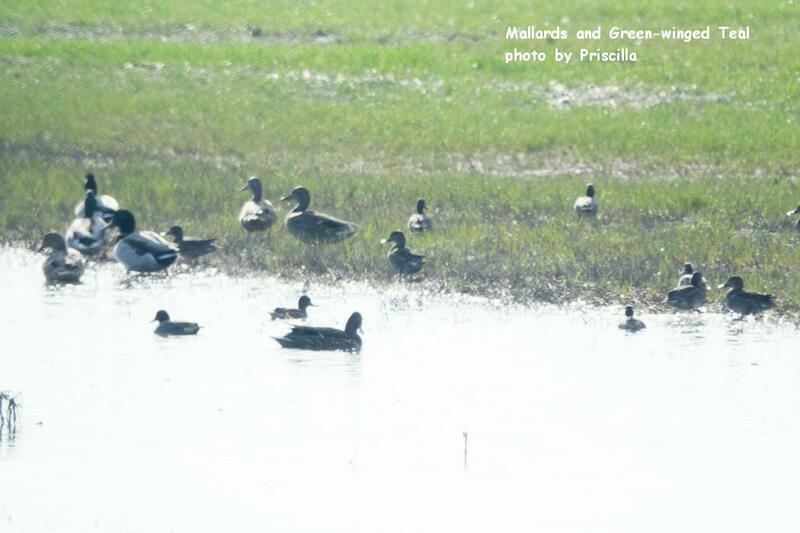 A swale carrying water along the shallow gradient through the grass fields had a small group of Mallard Ducks and Green-winged Teal. You might be able to identify another species, but I can't make it out with this photo taken through the windshield of the car. 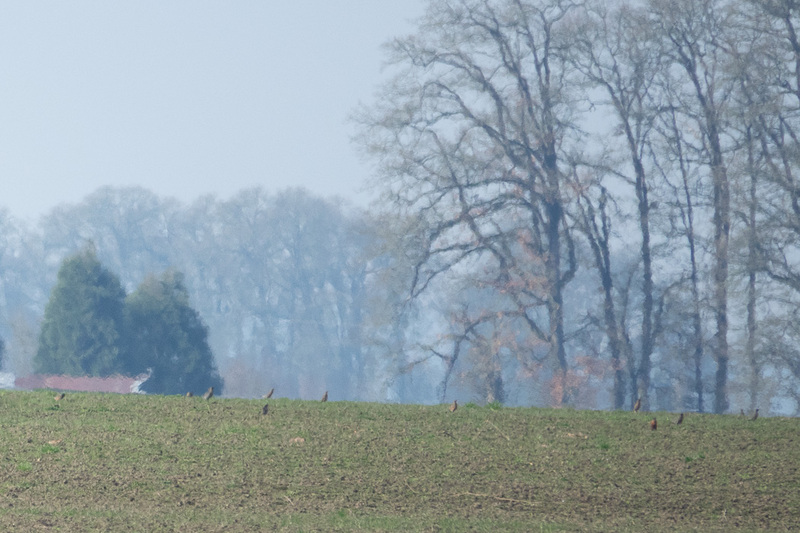 There were quite a few Robin-sized birds off to the northwest in another field across Bell Plain Rd. I'm often amazed at how hard BOGS members will work to identify birds at such distances. Later, at home, I went to google maps and measured the distance involved in this case. 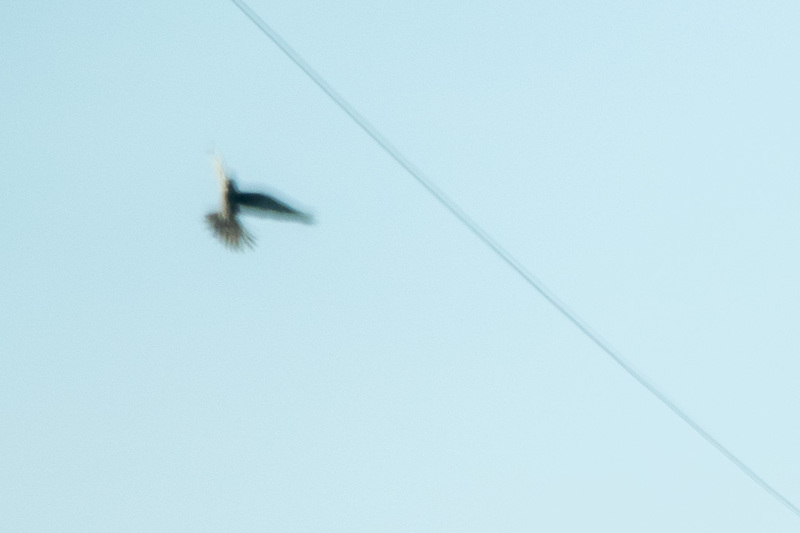 The birds in the photo below were 1/4 mile away. 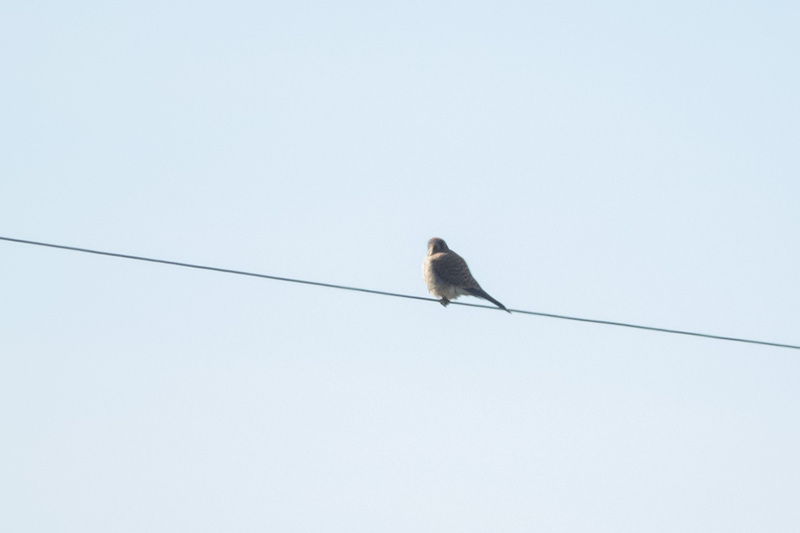 I looked at these birds briefly in my camera and all I could see is that they had the erect posture of Robins, so that's what I told those around me. 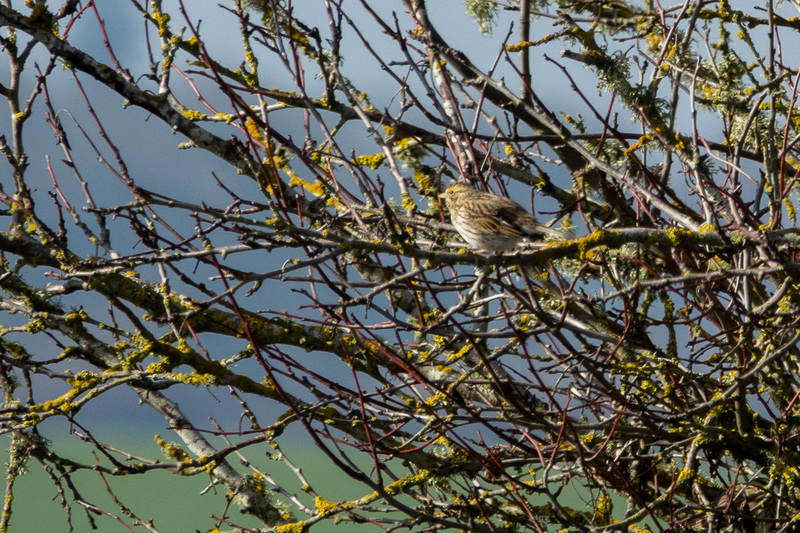 Some people were hoping for and trying to see them as American Pipits. (Patience! 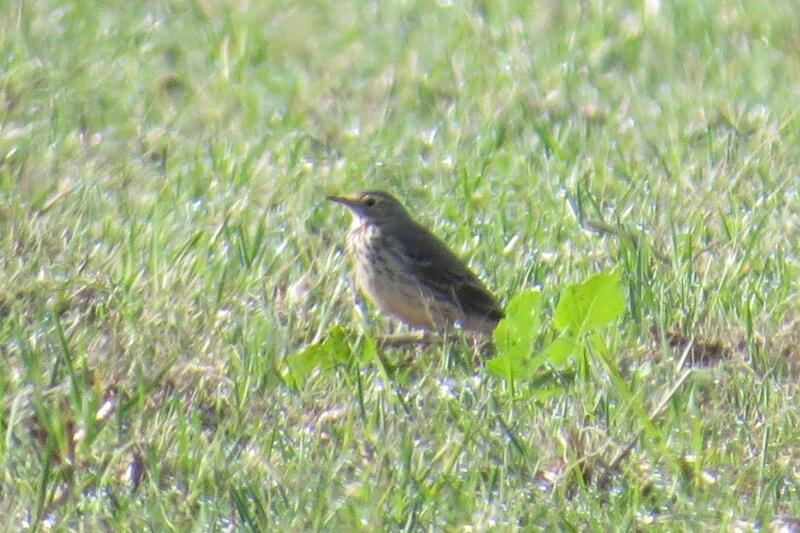 But they had no way of knowing we were about to see several dozen Pipits much closer to us, just a little further along Davis Rd.) Looking in my camera I thought I might have seen a little bit of color on one bird's breast, but only after getting the picture on my computer could I see them as well as the photo below shows them. Nancy reported 40 Robins, so I'm guessing this flock accounted for a good share of them. 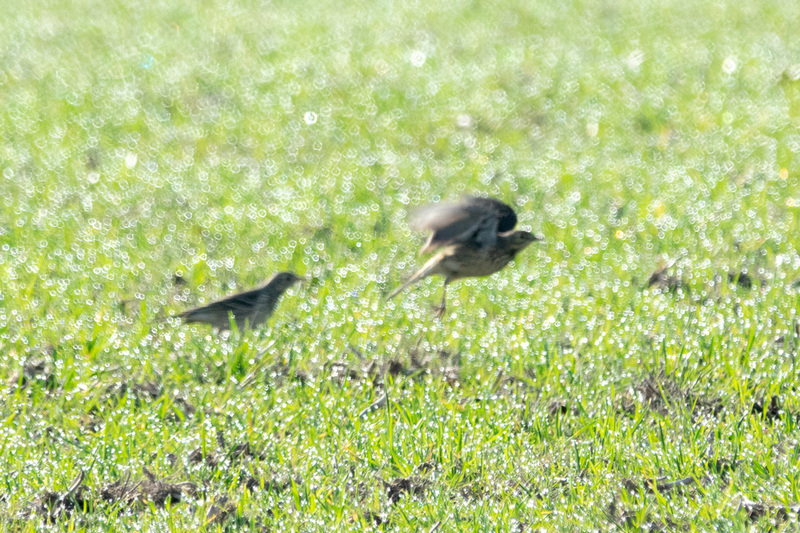 Typical of my few experiences with American Pipits, we saw them flying first. They were already flushed. And they fly like snowflakes in a blizzard; horizontal, chaotic and fast. 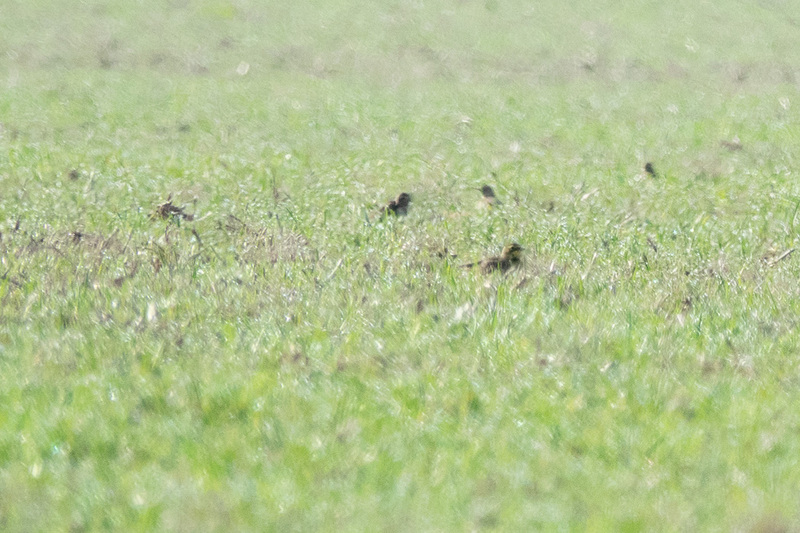 The few Pipits which did not fly immediately, kind of hunkered down low in the grass. We stayed where the Pipits were for 7 minutes. I took quite a few photos but it took a long time until a bird turned towards us enough that I could see the "necklace" and streaking that extends down from it. 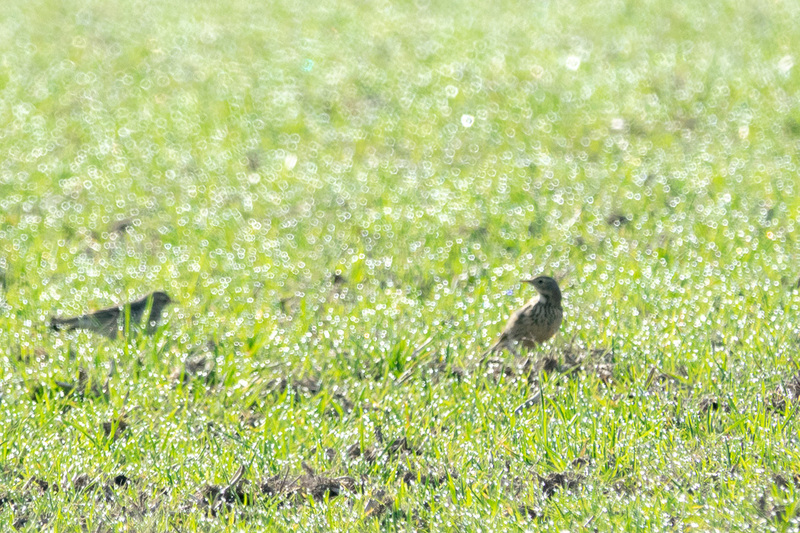 Janet's notes say she saw three small flocks of Pipits. 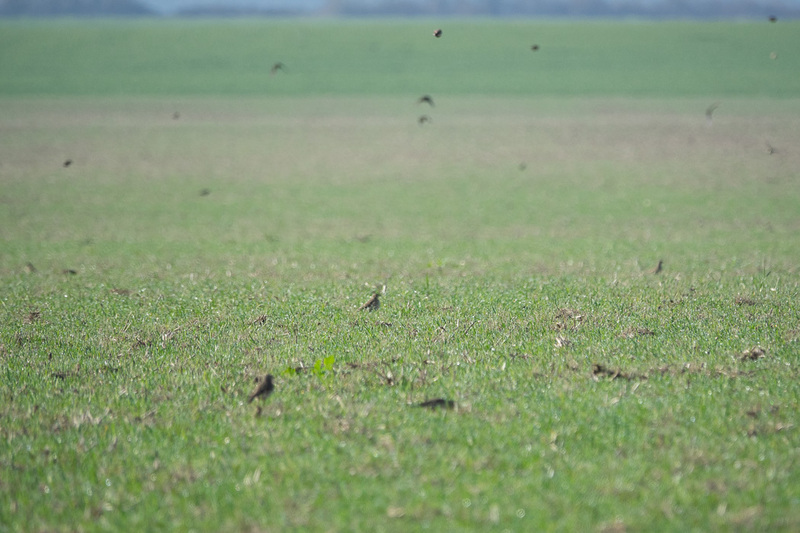 Nancy reported an estimate of 55 Pipits. The second photo of Pipits below - the profile side-view, was taken by Dave Stone. ... another Red-tailed Hawk. This looks blue because it was taken through the windshield and I don't spend much time trying to "fix" photos that are this out of balance. I include it here to further establish the ubiquity of these Hawks. 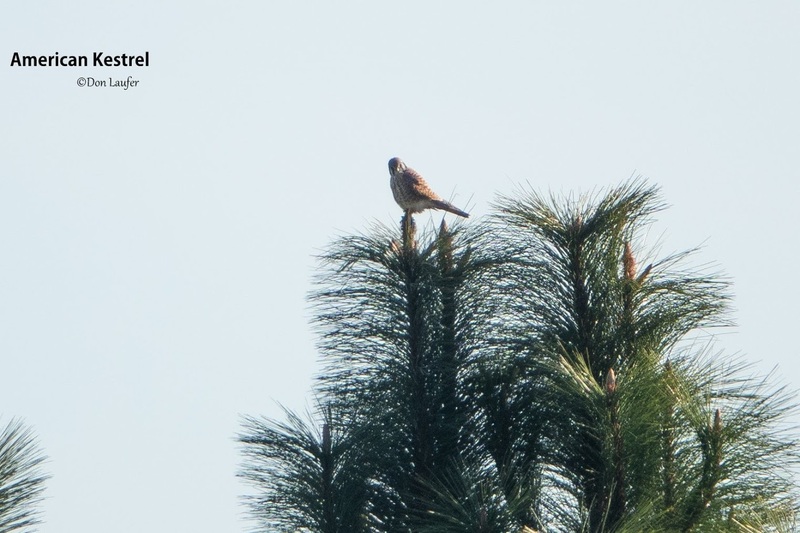 We saw the dive-bombed Red-tail at the first end of Davis Rd. This one is only about 3/4 mile further down Davis Rd. (It took us a half-hour to cover this short distance, because we were stopping for any birds seen). A very short distance further along Davis Rd we saw a flock of small brown birds. One that I photographed turned out to be a Savannah Sparrow. 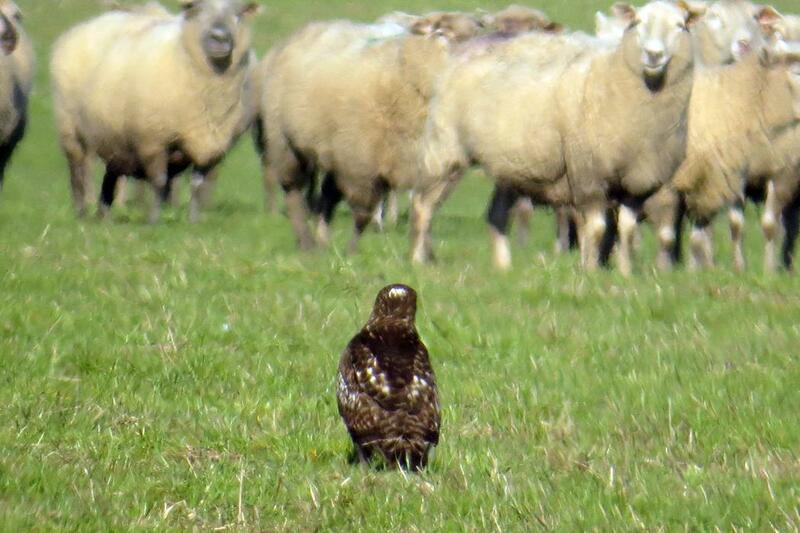 You can see the fine streaking along the flanks and a hint of yellow at the lores. Nancy counted 11 Savannah Sparrows. After leaving Davis Rd, We had only a few sightings over several miles of the same kind of grassland we had just been through. People in my car were talking about how different an experience it is to drive through so many square miles of grass-seed farms. Here and there a patch of trees, sometimes a homestead or ranch, and sometimes only the remnants of one. 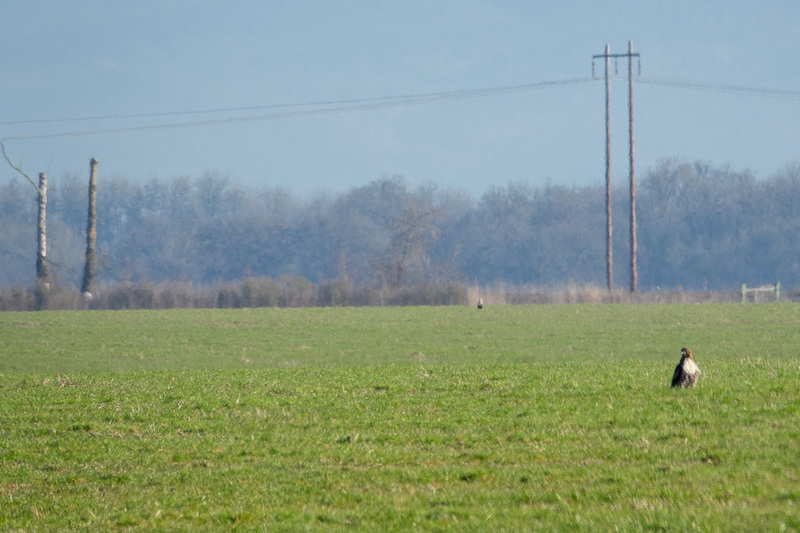 It might sound stark, but all the fields are bright green and some fields had Hawks sitting out in the distance. The city life drops away. One becomes fully immersed in being out there. It is calming and it seems to put one in a gentle, satisfying trance. 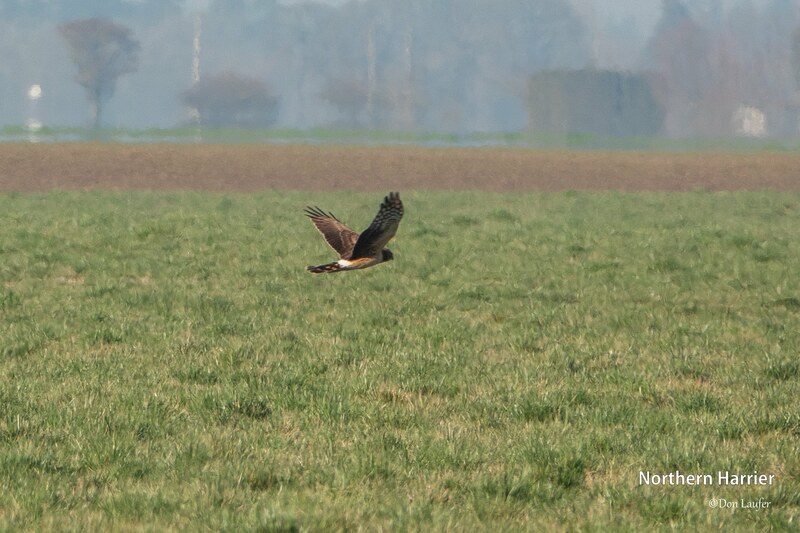 Somewhere along this stretch of miles, Don got these nice photos of an American Kestrel and a Northern Harrier. People show off new Raptor ID skills! I had put together ... or from both. 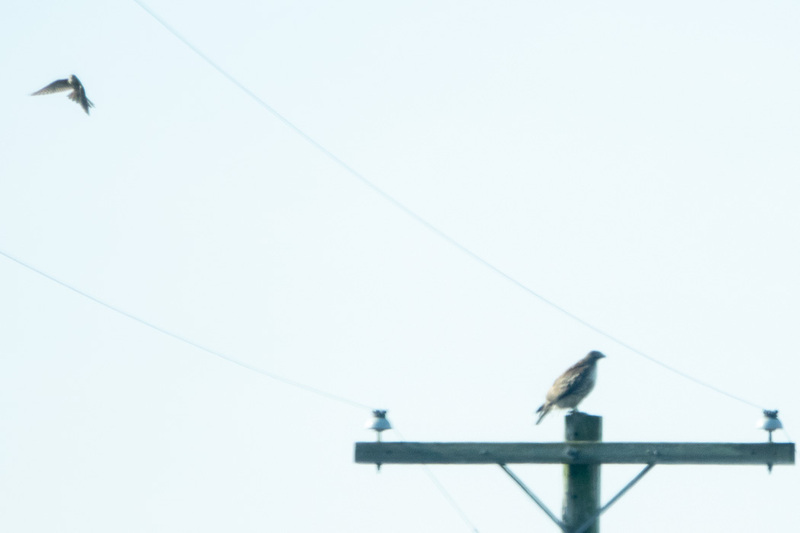 It was a nice feeling to see people happily finding themselves able to use their new tools to identify this Rough-legged Hawk even at such a great distance. Some sheep ranchers had assembled a temporary portable pen alongside the road. 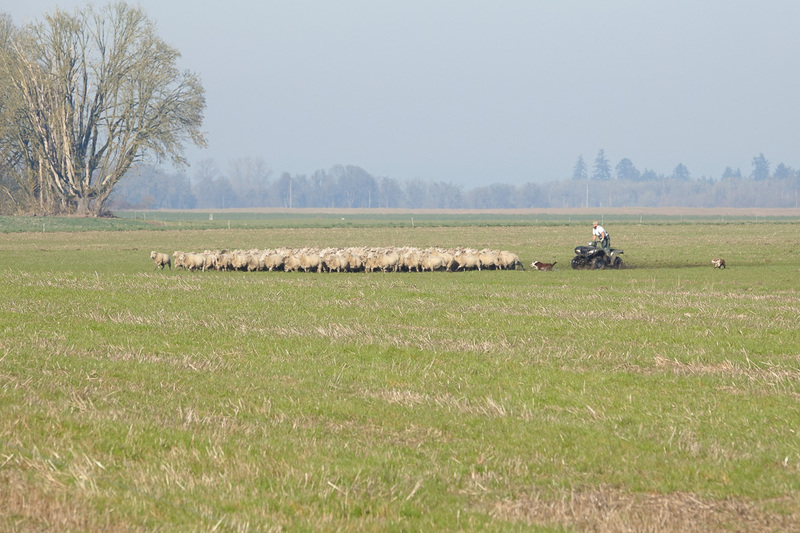 They had two dogs and used an all-terrain vehicle to drive the sheep to the pen. They only kept them in the pen long enough to separate out one or a few and then released the rest again. 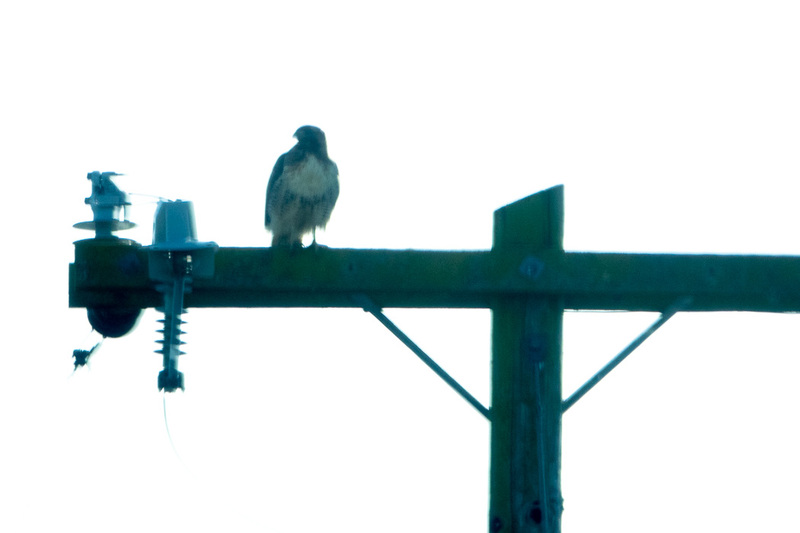 And there was another ... you guessed it ... Red-tailed Hawk. 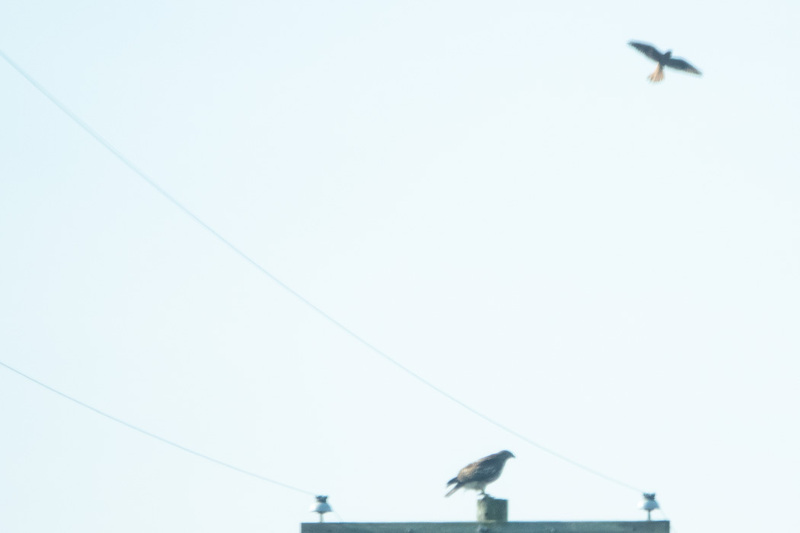 Perhaps it was watching for rodents to be driven out of their homes where the Hawk could go after them. 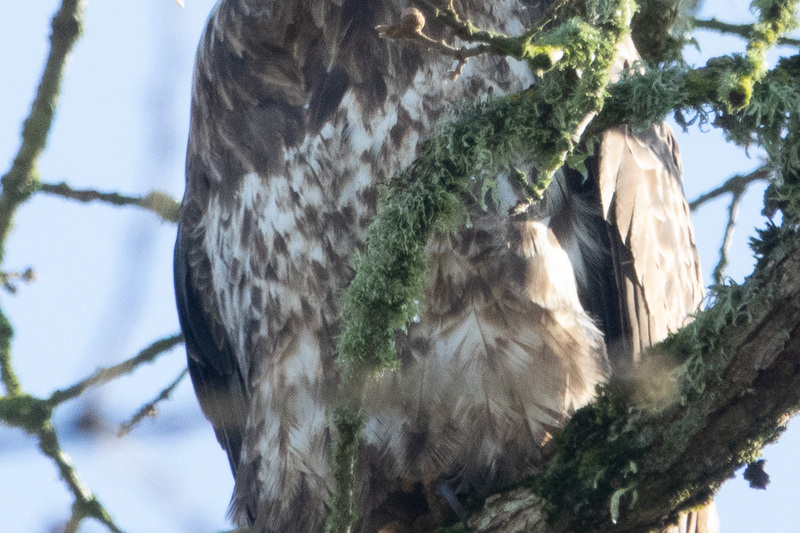 The close-up of the Red-tail was taken by Dave Stone. I like the mood this next photo conjures up for me. It's the trees that do it. For me they bring up a feeling of desolation. The trees are leaning and look old and in bad shape. Up close, this patch of trees does not look as though there ever was a homestead there. Why weren't they cut down like most of the original trees in this area? They appear to be simply a rough patch of ground that was left to its own fate. 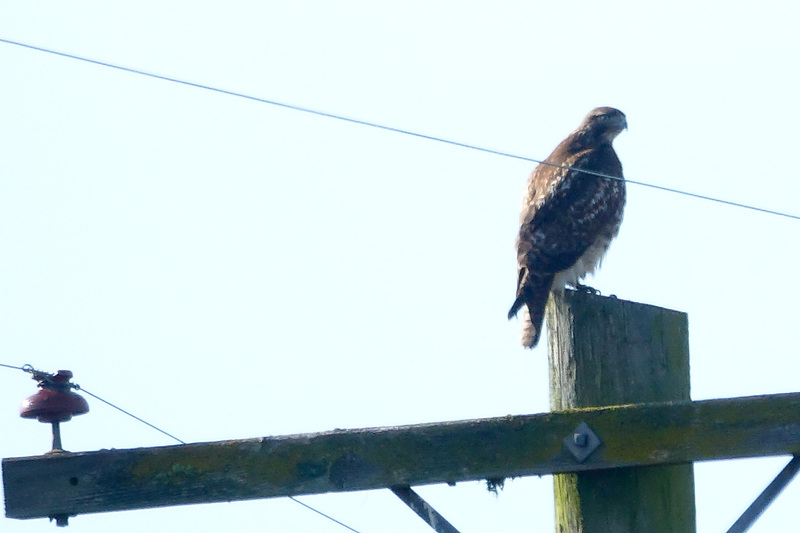 ... and yes ... that is yet another Red-tailed Hawk on that leaning stick next to the road. 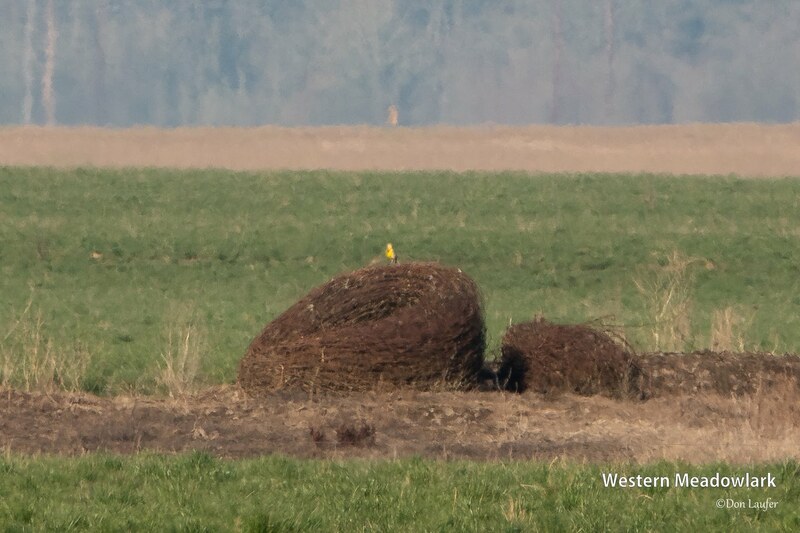 I missed seeing this Meadowlark, but it must have been quite a distance from the road, so I'm not surprised. The old spools of fence-wire could probably tell some interesting stories of the past. We drove the short 1/2 mile bit of road named "Creek Rd", which runs west from north-south running Smith Rd, to where Creek intersects American Drive. But we did not see much there. 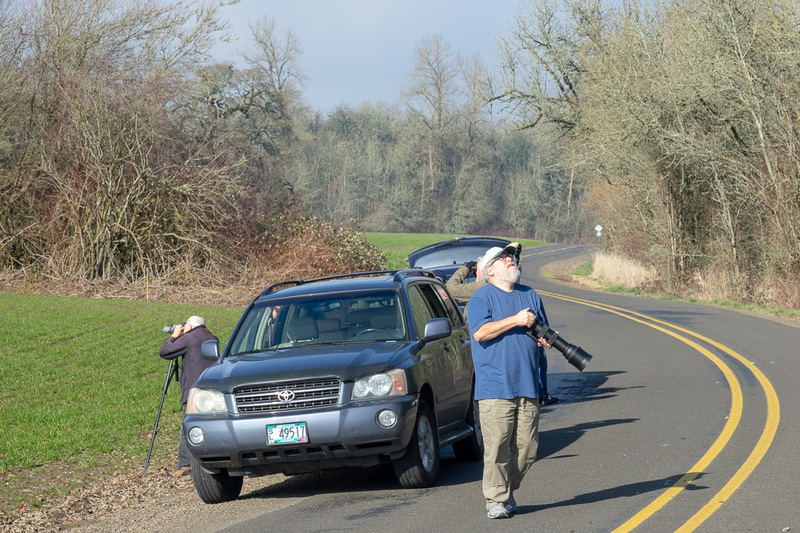 This stretch is popular with many birders, who report everything from Horned Larks in the gravel of the road, Burrowing Owls, Rough-legged Hawks, Northern Shrikes and Tundra Swans. I've visited here more than a half-dozen times and found a Rough-legged Hawk twice, and Tundra Swans a few times, but not much else. 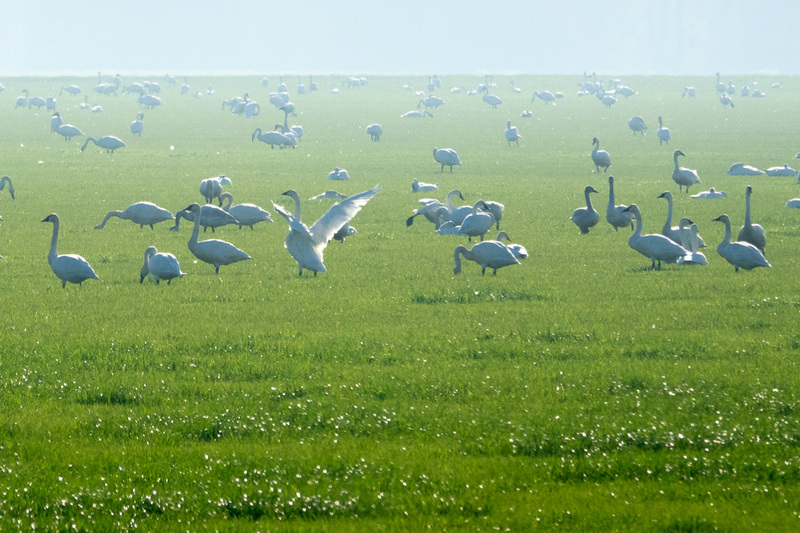 We saw a flock of Tundra Swans this time, but the late afternoon Sun is very low and the residual mist this close to the Willamette River left them looking gray rather than their usual brilliant white. 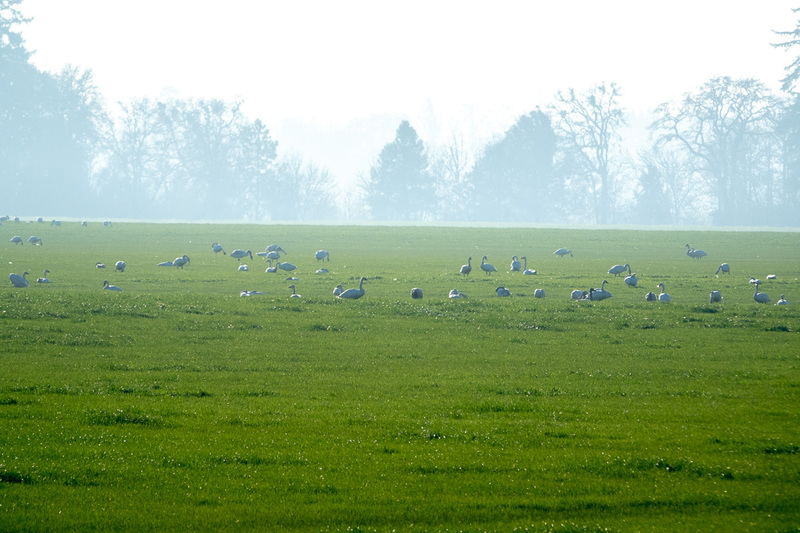 For a moment we actually thought they might be Canada Geese. They are still pretty though, seen through binoculars or camera. From this point we drove to the Halsey Public Park, where we all talked briefly and everyone went their separate ways home. My car stopped off at Diamond Hill Wetlands and did get a few peeks at Short-eared Owls both perched and flying though at some distance from us.